Do away with luggage rattling around in your boot, with this stylish and practical Car Caddy. The removable cooler section will make shopping so much easier. Manufactured from quality 600D polyester for a long life, this caddy will solve your car tidiness problems and can easily be folded away when not in use. Printed with your corporate logo, or engraved on the metal badge, this would make a great automotive related practical promotional gift. 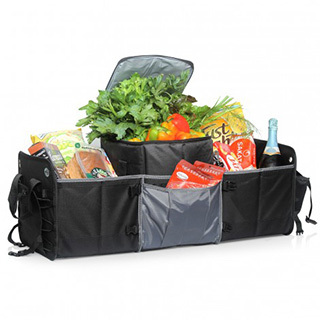 Centre tall cooler bag with zip lid and front pocket is removable - take with you when shopping!